I don’t know much about them. Moving on, I’m not sure if there was another pontiff between John and Benedict. All I remember about Benedict is that he quit. To whom did he submit his two weeks notice? Everybody loves the guy. Described as “rock star”. Unusual for popes! Okay with gay people. Also unusual for popes! Stole a cross out of a dead priest’s hand. Admits it publicly. Wait, what? My brother-in-law told me about the last thing. He was impressed by the Pope’s confession, and by how humanizing it was for Pope Francis to say such a thing openly. Francis had admired the cross for a long time. And when its owner died, and Francis was paying his last respects, he noticed the cross in the deceased’s hand, in the casket. No one else was in the room, and Francis took it. And now he keeps it in the pocket of his robes, and he touches the cross now and then, and it reminds him that we are all sinners. 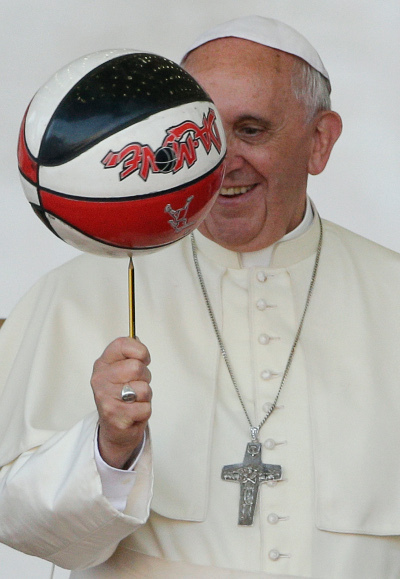 The first pope to ever have fun. That looks like an A.W. Faber-Castell Dessin 1386 B.
I haven’t been inside churches much since I was a kid. My brother and sister and I went through C.C.D, and all of us had First Communion, but around the time the youngest of us got there, my parents divorced and we were no longer required to attend mass, so we all stopped. I hated wearing dress pants. And they said the same thing every week. And I was afraid of Hell, and they talked about that a lot. These days I only step inside churches for weddings or funerals. Or, praise the Lord!, flea markets. Multi-family tag sales and flea markets are often held in churches. When I heard about Francis and the stolen cross, we were on a family vacation in coastal Massachusetts. Walking around a few days later, we saw a big indoor tag sale in a steepled building. My girlfriend and I went in. We got a few books, and then we checked out the art sale, or maybe it was a bake sale. The pencils in question are actually worth ?500,000 and form part of a ?10million Damien Hirst art installation.